The banner at the top has a slightly different message and provides additional information: "Office Mix is retiring on May 1, 2018. Starting April 6, 2018 you will no longer be able to upload new or update existing recordings using the Office Mix add-in for PowerPoint. Please sign-in to migrate or download all your content". Office Mix was a free add-on for Microsoft PowerPoint that never left the preview stage. Office Mix added interactive elements like quizzes or polls to PowerPoint presentations and integrated options to upload new mix content to the web, OneNote or other learning environments. Users cannot create new content as of April 6, 2018. Those who have not exported the data yet have time until May 1, 2018 to do so. 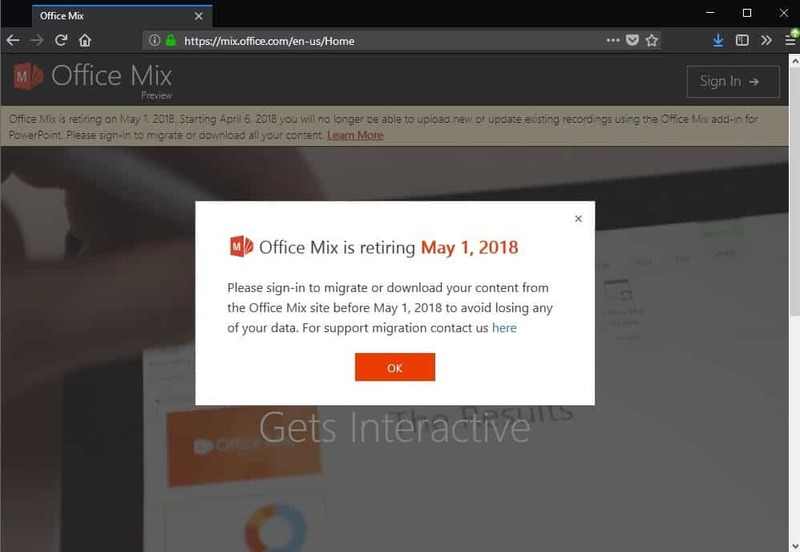 Any content on Office Mix starting on the day of service retirement won't be accessible anymore. Links that point to content won't work anymore, and certain add-in elements such as quizzes or polls may no longer be available either. Visit the Office Mix website and sign in with the Office 365 account. Click on the migrate button. Click "migrate now" on the confirmation page after you read the instructions and information on that page. You are asked to sign in to your Office 365 account after you click on the "migrate now" button. This migrates mixes to Microsoft Stream. Note that this won't include quizzes, analytics data or apps. Visit the Office Mix website and sign in to your account. Click Presentation under "uploaded mixes" to download mixes as PowerPoint files. Some presentations may have a video button; click it to download the video of the mix. Select Analytics and click on the Excel icon to download quiz results and analytics data stored in an Excel file. Additional information and instructions are published on this Support page on the Office website. Now You: Have you used Office Mix? It is fascinating to think that despite having had a 40 year career in ITU Microsoft are now retiring something which I’ve never heard of. Yeah, you will be amazed how much crapware MS’s devs make. Yes, there was something else Microsoft recently retired that I’d never heard of, either. I forget what it is. But then, much of the time I hear about Google retiring things, they’re things I never heard of. Perhaps that’s one of the reasons these things are getting retired… not enough people know they exist.